This is most definitely one of the best-known commercial rock songs from the 1980s. 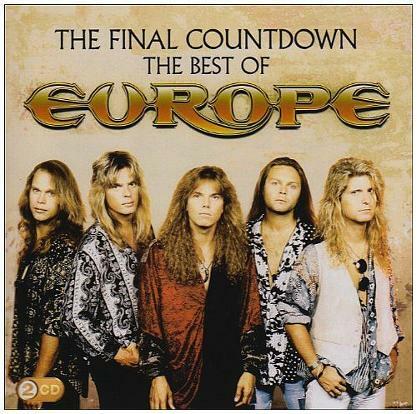 "The Final Countdown" was the title track from the 3x Platinum (U.S) selling album (the Swedish band's third studio album) and made No.1 in 25 countries, including the UK. It peaked at #8 on the U.S. Billboard Hot 100. The lyrics (and that legendary brassy keyboard riff) were originally created by vocalist Joey Tempest on an old Korg Polysix keyboard in the early eighties. The band had mixed feelings about using the riff, as using a keyboard to form the main part of a song was a pretty radical move for them, although there were plenty of keyboard heavy rock bands and songs around in the 80s, including Frankie Goes To Hollywood's "Warriors of the Wasteland", which was at No.19 in the same week that Europe reached No.1 in the UK on November 30th 1986. 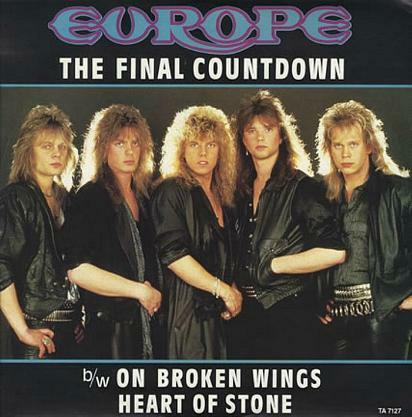 "The Final Countdown" pushed Berlin's "Take My Breath Away" down to No.2, after a four week stint at No.1. In it's second and final week at No.1, Europe prevented Erasure from reaching the top spot with "Sometimes". The music video features footage of the band in concert at Solnahallen in Solna, Sweden, during the 26th and 27th May 1986. There is also footage of the sound checks done at the concerts. So which is your favourite segment of the song? Is it the aforementioned synth riff, the drum break from 3:12 to 3:16, or the guitar solo which immediately follows it?